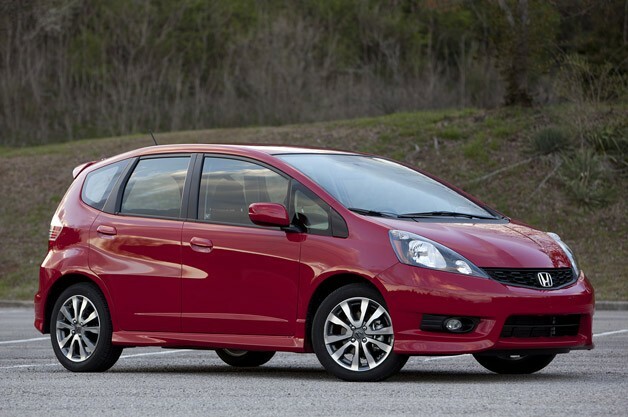 The current Honda Fit has been around the block a few times. The subcompact hatch has soldiered on without significant revision since its first update for US customers in 2009, and while Honda is on the verge of launching a third generation, we thought we'd take the time to see how the runabout stacks up against the new wave of small, efficient and plucky five-doors now on the American market. Those include old standbys like the Nissan Versa and Toyota Yaris, as well as relative newcomers like the Chevrolet Sonic and Ford Fiesta. Those machines may have all covered ground on the Fit, but Honda's wee machine holds a pleasant surprise for those buyers still willing to give the car the time of day. While the rest of the Japanese automaker's lineup has succumbed to dreaded model bloat, the Fit has remained true to the spirit of Honda that we remember from our vagabond youths. This may very well still be the closest genetic ancestor to the Civic models of old. Outside, the Fit Sport continues to wear its "I'm the meanest June Bug" looks with pride. The oversized, wedge-shaped headlamps and aggressive lower fascia help lend the design plenty of attitude up front, and our tester's 16-inch alloy wheels keep this Honda from looking like it was the cheapest thing on the lot. Still, with a massive windscreen, tall greenhouse and short wheelbase, the Fit Sport can't help but look over-inflated, but that's a criticism we could levy at nearly every other product in this segment as well. 2013 Honda Fit Sport originally appeared on Autoblog on Mon, 29 Apr 2013 11:57:00 EST. Please see our terms for use of feeds.